As part of a recent project, I needed to create a dashboard page for the requests for executive management. However, since the data was in a list and not a database this was easier said than done. So I started off by researching my options and I found this post on MSDN. 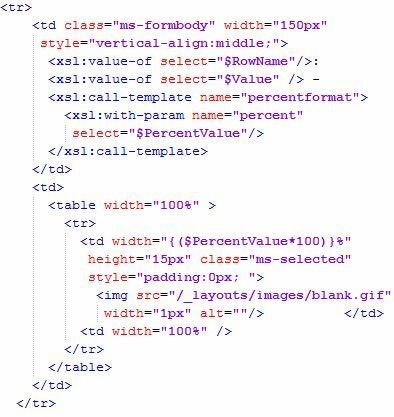 This post explains very well how to modify the XSL of a DVWP to create a bar graph. I used this post and the code below to do as such. You will noticed that I overwrote the .ms-selected CSS class so that I could control the image as well as the colors of the chart. My second issue was that I wanted a vertical bar graph too. I was unable to find an example anywhere on the web, so I sat down and started playing with the code. Now to change the above chart into a vertical bar chart we have to replace three sections of code. I created a new class called .ms-selectedc and the c stands for column. Finally we have to change the XSL that creates each bar. Depending on the length of the column titles, you may have to play with the height and width of the table where the title and percentage is created. If anyone has any suggestions for more efficient code, please let me know. I also suggest filtering out unneeded data in the CAML so as reduce load on the client. I’ve explored online for illustrations like this one, where you need to make line for each row in the record and make row for each line that you show in the DVWP.